In the world of grapes, the term 'cultural practices' can sometimes be used as a catch-all phrase, but generally it refers to topics that relate to growing the crop itself. This includes issues like choosing varieties and rootstocks, trellis and training systems to support the vines, managing the vines' canopies and cropload to meet production and fruit quality goals, winter pruning and more. You'll probably notice quickly that topics like these are also related to and influenced by information about pest management, vineyard nutrition and business management. One of the components that influences yields in grapevines is the number of berries that set and mature on each cluster, or "fruit set". Each flower cluster contains many individual flowers, each of which has the potential to become a grape. However, not every flower will successfully pollinate or develop a healthy embryo and the surrounding tissue that becomes the fruit that we want. This article covers some of the factors that influence fruit set in grapes and summarizes practices that growers could use to influence set. 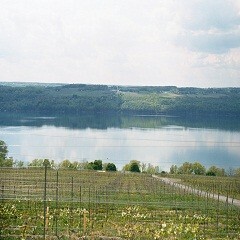 It was originally published in the June 2013 issue of the Finger Lakes Vineyard Notes. Dr. Kees van Leeuwen is a professor of viticulture at the University of Bordeaux. His work focuses on the effects of environment on terroir. He is also the viticulture consultant for Chateau Cheval Blanc in St. Emilion, one of the premier producers in Bordeaux, which uses a high percentage of Cabernet Franc in its wines. Dr. van Leeuwen visited the Finger Lakes in late October, 2014 and presented a seminar to the region's industry about the role of Cabernet Franc in Bordeaux production, and some of the results of research that he and others have done on the variety over the past several years. Dr. van Leeuwin was kind enough to give his permission for us to share the slides from his presentation to the industry. Dr. Benjamin Bois, an associate professor in viticulture and climatology from the University of Burgundy, speak to Finger Lakes growers and winemakers about Pinot noir production in Burgundy and how it is influenced by climatic and site conditions.